Hermes and watchmaking is a long love story. From craftsmanship to poetry, Hermès rolls out a beautiful story for watch-lovers. When the French luxury company launched the Slim d’Hermès, it was not only a big statement but also they created an amazing creative platform for future developments. 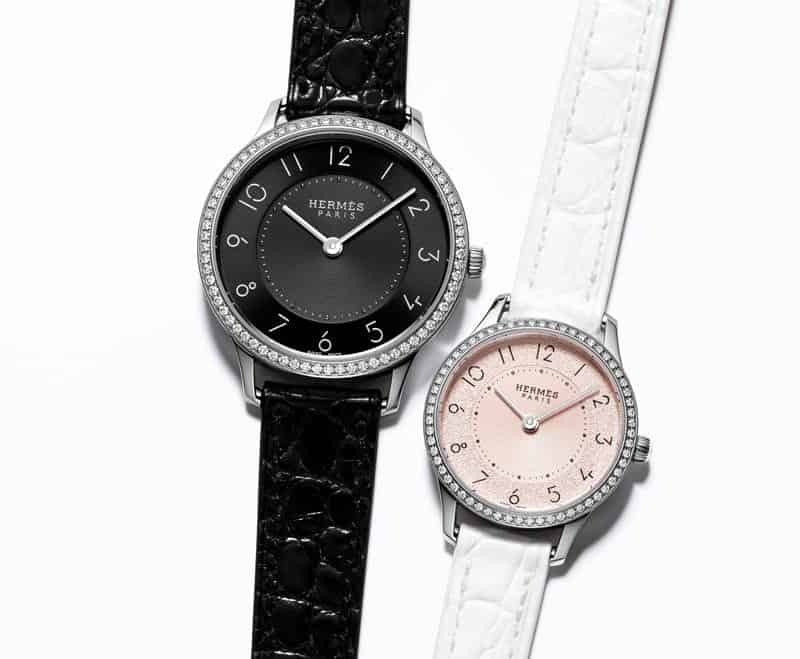 With 2 new variants today, the Slim d’Hermès features opaque black lacquer or translucent magnolia white. Crafted in the Hermès watchmaking workshops and available as small and very small models, the Slim d’Hermès watch reveals itself exactly as it was conceived: with utter simplicity. Slim d’Hermès cultivates a sense of opposites along with pared-down purity. 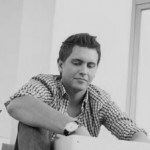 Its supremely understated lines stem from rigorous stylistic research. Its slender silhouette, broad dial opening and the aesthetic details of its lugs: everything about this design accentuates its quintessential nature. Its strength also lies in the original font of its numerals, created like a musical score by graphic designer Philippe Apeloig. This eminently pure and meticulously thought-out script is distinguished by nely traced lines interspersed with ‘silent’ spaces, setting a lively cadence for the passing of time. 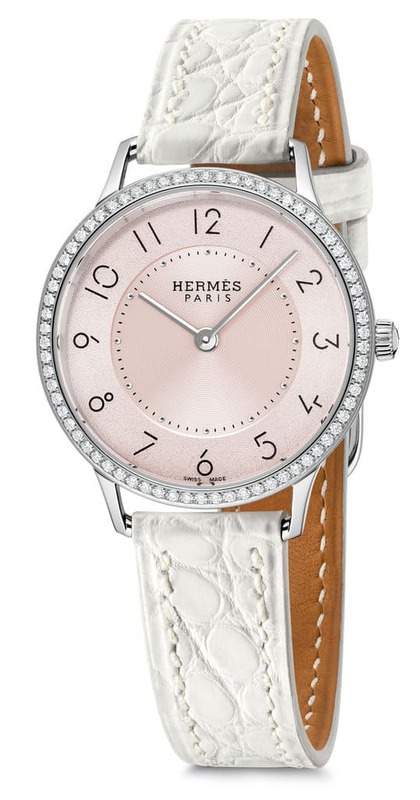 Hermes creates timepieces as crafted objects by the hands of artisans. 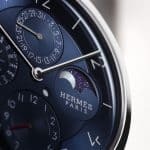 This makes a Hermes watch a true companion to those who wear them. Practical, functional and stemming from uncompromising expertise, they radiate the lightness of the unexpected. They make everyday life their playground, and each instant a uniquely special moment. For Hermès, time is also an object. Its inherent tension is translated by the house into a singular characteristic. Rather than measuring, ordering, and seeking to control it, Hermès dares to explore another time, designed to arouse emotions, open up interludes and create spaces for spontaneity and recreation. Two new models are now presented, one featuring an opaque black lacquer and a second one showcasing a magnificent translucent magnolia white. 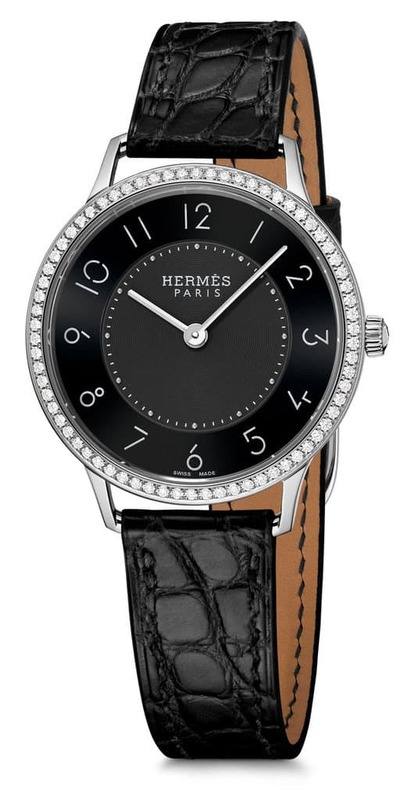 With this new model, Hermès features a 316L stainless steel case set with 60 diamonds. Two sizes are available: 32mn and 25mm. The dial is black lacquered with a white transferred Arabic numerals and minute circle. We can note the pearl-shaped hour-markers and the sunburst chapter ring in the center. The hands are rhodium-plated sandblasted. The movement is s Swiss-made Quartz movement with a Smooth Black Alligator strap marked by a 316L stainless steel folding clasp. This other new version has also a 316L stainless steel case with 60 diamonds set. Two sizes available as well: 25 and 32mm. The dial is very beautiful with a translucent magnolia white lacquer and a black transferred Arabic numerals and minute circle. Let’s also highlight the pearl-shaped hour-markers and its sunburst chapter ring in the center. 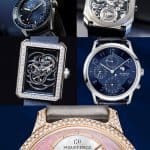 the hands are also rhodium-plated and sandblasted. The movement is a Quartz Swiss-made movement and the strap is a Chantilly white matt alligator featuring a 316L stainless steel folding clasp.